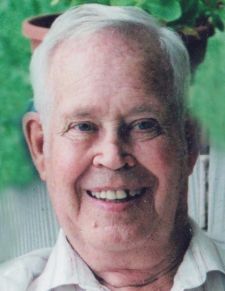 Herbert Elwood DeHart, 89, of Stoneville, passed away Thursday morning, September 6, 2018, at Hinkle Hospice House of Davidson County in Lexington, NC. A funeral service will be held at 2 PM on Sunday, September 9, at Fair Funeral Home Chapel with burial to follow in Ridge-View Memorial Gardens. Military rites will be performed by Rockingham County Honor Guard. The family will receive friends one hour prior to the service (1 - 2 PM) at Fair Funeral Home and other times at the home of his daughter. Mr. DeHart was born April 2, 1929 in Stoneville, NC to the late George Goodwin DeHart and Elizabeth Cox DeHart. He was preceded in death by his wife of 48 years Elnora Murray DeHart. He served four years in the US Air Force, serving during the Korean War. After returning from his military service he worked for E. I. DuPont Industries and was owner of DeHart Electronics Service. He taught Electronics for 20 years at Ruffin High School and Rockingham County Senior High School. He is survived by his daughter Kathy DeHart Weaver and her husband Barry W. Weaver; his grandchildren, Carl Weaver and Nora Weaver, of Lexington, NC. Mr. DeHart's siblings are JoAnn DeHart Underwood and her husband, James Underwood, of Eden, NC, Robert DeHart and his wife, Gladys DeHart, of Stoneville, NC, Lucy DeHart Cadd and her husband, Emory Cadd, of Kernersville, NC, Billy DeHart and his wife, Jerilynn DeHart, of Morristown, TN, as well as many nieces and nephews. Mr. DeHart had many hobbies during his life that centered around working with his hands. He enjoyed designing and creating new inventions. His hobbies included building radio controlled air planes, camping, fishing and gardening. So sorry to read of your dad's passing, Kathy. Such memories of you all many years ago. My deepest sympathies to you and your entire family.